Color Wheel Pro is the only tool that allows you to see color theory in action: you can create harmonious color schemes and preview them on real-world examples. The preview is real-time: when adjusting the color scheme, you see the changes immediately.Color Wheel Pro includes all the classic color schemes: Monochromatic, Analogous, Complementary, Split Complementary, Triadic, and Tetradic. Color Wheel Pro supports both Mixing (Red-Yellow-Blue) and Visual (Red-Green-Blue) color wheel types. You can easily switch between these types and create color schemes based on both RGB and RYB wheels. You can experiment with saturation and lightness of each color in the scheme. This gives you unlimited variations of the same color harmony. 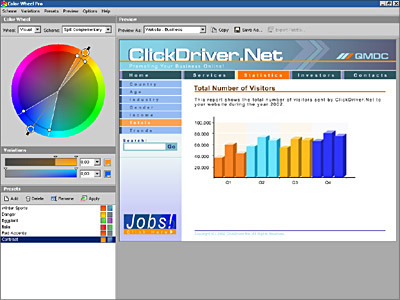 Color Wheel Pro shows color schemes on real examples. Two types of color wheel. Comprehensive documentation on color theory. Qweas is providing links to Color Wheel Pro 2.0.1 as a courtesy, and makes no representations regarding Color Wheel Pro or any other applications or any information related thereto. Any questions, complaints or claims regarding this application Color Wheel Pro 2.0.1 must be directed to the appropriate software vendor. You may click the publisher link of Color Wheel Pro on the top of this page to get more details about the vendor.